They call it a “good” or positive pain because a quick muscle "grab" is followed by a feeling of relief and relaxation. IMS uses implements adapted from traditional acupuncture and is based on scientific neurophysiological principles. 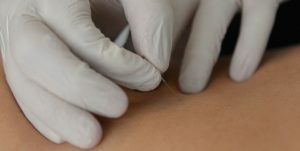 During a treatment session over active muscle fibers are identified and a thin acupuncture needle is briefly inserted. Because the muscle is supersensitive and shortened, you’ll feel a peculiar sensation—like a muscle cramp or Charlie Horse. This distinctive type of discomfort is caused by the muscle grasping the needle. Patients soon learn to recognize and welcome this sensation and call it a “good” or positive pain because it is followed by a feeling of relief and relaxation. Multiple fibers may need to be needled, even in a small area, to reduce the spasm and pain in the region. The effects of IMS are cumulative– needling stimulates a certain amount of healing, until eventually, the condition is resolved and the pain disappears. Some patients treated with IMS have remained pain-free for over 20 years. Doctors usually have no difficulty in treating pain caused by injury (a fracture, for example) or inflammation (such as rheumatoid arthritis). Often they are perplexed by pain that shows no sign of tissue damage or inflammation, such as headaches, “whiplash”, backache, tennis elbow, or frozen shoulder. Dr. Chan Gunn, the developer of IMS, introduced the concept of “neuropathic pain” that occurs when nerves malfunction following minor irritation. Nerves and nerve-endings become "super sensitive" and cause innocent, harmless signals to be exaggerated and misperceived as painful ones. The result is pain, even when extensive medical tests show there is “nothing wrong”. Until recently, supersensitivity has received little attention in medical circles. Supersensitivity and muscle shortening cannot be operated on and “cut away”. “Pain killers” and other analgesic pills only mask the pain. The goal of treatment is to release muscle shortening which presses on and irritates nerves. Supersensitive areas can be desensitized and the persistent pull of shortened muscles released. Many people who suffer from chronic pain become frustrated and depressed when their doctors cannot help. Some try medications and traditional physical therapies (such as massage, physiotherapy and manipulations), even surgery, and do not find lasting relief. IMS is an effective treatment for chronic pain, even when there is no injury or inflammation, and offers a scientifically proven method for diagnosing and treating it.